See a complete list of our Sponsors and Partners here. 2014 saw more clean-ups that we've particpated in than ever before. From St. Louis to St. Joseph, River Relief volunteers got a lot done. from 107 miles of river! In September & October, Missouri River Relief conducted our second Big Muddy Clean Sweep, a two-month continuous clean-up from Brunswick to Hermann. The river threw us constant curveballs, with several events being revamped at the last minute by flood conditions. But as always, the Missouri River Relief staff and volunteer crew rolled with the punches and made each event a special one. Read more about this year's Clean Sweep here. 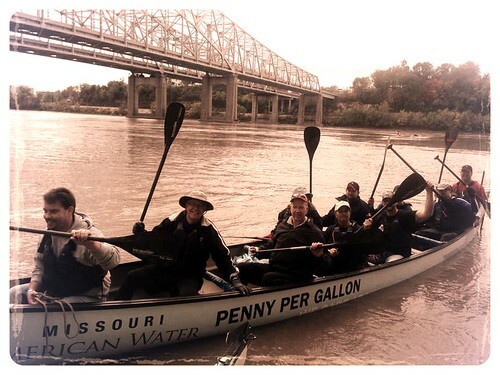 Missouri River Relief made a conscious effort to grow our organization this year. With the addition of a full-time educator, we brought the Missouri River into the classroom, and more importantly, the classroom to the Missouri River! Alex Prentice joined the MRR team as our first ever education coordinator. In April, he jumped into the Spring whorl wind and began to engage with community partners and schools up and down the river that we were already working in. We try to make education a part of everything we do, and our custom education events work for diverse audiences and purposes; from at-risk students to adults looking for a deeper understanding of the longest river in North America. In 2014, we brought over 1,000 students and teachers to the river to learn about its secrets. Whenever possible, we bring students to the river. Our goal is to work with our talented partners to share knowledge about the river right on the river’s edge. So you can point to it. For the last several years we’ve enjoyed working with students from Douglass High School in Columbia, this year 73 students & teachers got to take an educational river trip past an active eagle’s nest, up to the I-70 Bridge and along the amazing Moniteau bluffs, where we could stopped to check out a spring flowing out of the Lewis & Clark cave along the Katy Trail, and point out the petroglyphs above it. Students then were able to explore a sandy island, and pick up plastic bottles that littered its beautiful shores. Get kids out on the river to clean it up! Through direct experience and a little effort, they walk away with a renewed relationship to the river and more knowledge than they thought they’d gain on a boat trip. Our “Day on the River” program combines riverside watershed and environmental education while physically doing something to make the river a better place. We enjoyed three “Days on the River” in Kansas City and Hermann this year, working with six schools and 7 grade levels. This summer, we also enjoyed our growing partnership working with 4H and University Extension. We took out three separate groups of kids from across the state, and across the nation for an introduction to the Big Muddy. One of those lucky groups enjoyed our first, week-long Summers@Mizzou "Meet the Big Muddy" river camp! It was a huge success, thanks to some special partners and amazing hands-on activities that included fish, turtle and bird sampling! The next best thing to bringing the classroom to the river is to bring the river to the classroom. We love to share our river knowledge, strange trash tales and beautiful photos. The kids appreciate a fresh voice in the classroom and it gives great context to their river experiences. 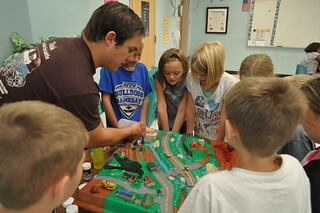 In 2014, Alex was able to visit three schools in Boonville and New Franklin, working with over 300 students over three days, tailoring diverse river related activities to each grade level. Cleaning up trash on the Missouri River is a big job. But we don’t stop there. By building a connection and understanding of the river, we foster citizen stewardship. Young, growing minds are the best place to start. Because the easiest way to get rid of trash, is if it never ends up in the river in the first place. We are super grateful that Alex is on board, and he’s done a positively stellar job at rolling with the foundations we have built in each river community throughout the years. Now he is helping us develop new and even better educational programs. So stay tuned, the future is bright! Thank you for another great year on the Missouri River! What makes it possible is a confluence of engaged partners with a simple, but difficult goal; bringing their community together across city and state boundaries to work along a single river system. A nucleus of dedicated volunteer crew members have been putting in long weekends since 2001, travelled the length of the Lower Missouri River many times over, honed our event systems and shepherded over thousands of volunteers onto boats to clean up the Big Muddy. There's citizen groups and individuals in each community that welcome our project and help get it done. There's volunteers from countless groups, families and backgrounds that give up their Saturday morning to improve their river. There's a fleet of boat operators. 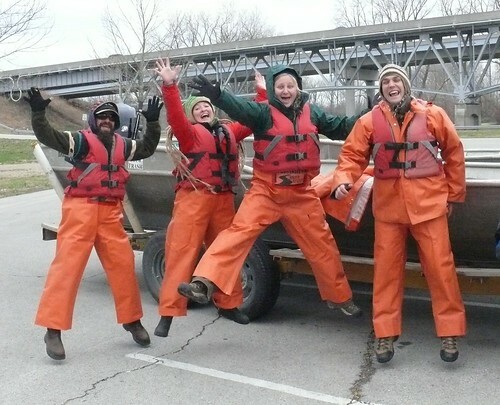 State and federal agencies, local river-oriented businesses, friends with boats, outfitters with fleets of canoes - they all share the belief that this is part of their duty to the river they love. There's a long list of sponsors and partners - they provide the cash and services it takes to mobilize this clean-up effort. From fuel to t-shirts, to reusable water bottles and dumpsters. It's a community effort. 2014 was Missouri River Relief's 14th year, and it was a great success thanks to you! See you on the river in 2015!